Flatbed die cutting was the primary form of printing and die cutting for many years but as materials and the ability to manipulate them have improved rotary dies have become more and more practical even for smaller jobs. The work of die-making pioneers such as Phil Saunders in conjunction with Ward Die-cutting Machinery has brought rotary die-cutting to the fore over the last 20 years. Still flatbed dies are considerably less work to construct and when rapid turnaround times are required for smaller jobs it makes sense to go with a flatbed die. There may also be design considerations that would make a flatbed the preferred choice. Where a very complex die design is required a flatbed may be chosen even for runs where a rotary die would be chosen with a simpler design. Improvements in rotary die-cutting evolved to the extent that Rotary is becoming an ever stronger contender and can now perform with excellent results on automatic packing lines. While flat and rotary are fundamentally the same from a craft perspective in manufacture, each presents it’s own challenges and it’s own solutions. They compliment each other very nicely. Pre-Makeready can apply to a variety of different tasks and components but it essentially includes anything that is necessary to setup tooling (flat or rotary) on a machine in advance of running a job. These activites and components serve to streamline the cutting process, making it more efficient and cost effective. It also facilitates faster turnaround times. Counters can serve a variety of purposes for flatbed die cutting. While their primary function is for crease formation, they typically aid in reverse-scoring and reverse-score-perforation on the reverse side of the board from the die. 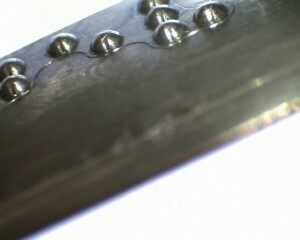 While some of these effects such as creasing may be achieved without a counter a counter gives a more precise result. Counters are also used to aid in the positioning of braille and embossing components. Counters are a key aspect in facilitating cutting on both sides of the carton board in a single impression rather than having to reverse the board and re-cut it separately. This process is knows as reverse-scoring. In flatbed die cutting the sheet remains in tact after being cut. This is usually aided by small nicks and other design features in the tooling. Removing waste areas from the sheet is a necessary part of the production process and is greatly supported by the tooling. 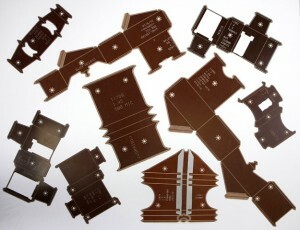 This can potentially be a time consuming process particularly if it has to be done by hand with very complex die cuts. Stripping tools are designed and supplied by Truform to remove waste areas from the sheet as efficiently as possible and at high speed. Designing a stripping tool is critical if optimum performance is to be achieved. It has to ensure all parts come away cleanly without damaging the actual cartons while allowing the web to be stripped quickly and not compromising overall machine performance. In solid board packaging and in particular, for the healthcare and pharmaceutical industry Braille labelling is very important and is in fact required under EU legislation. Allowing the visually impaired to determine what is in a package and when it expires is vital to the safe use of pharmaceutical products. Braille components can be incorporated into a flatbed die with the result of braille dots being applied to the carton during th e die-cutting process. There are stringent controls around dot size and shape and managing this whole process is quite complex. Truform manufacture these braille components and within our process we define variables that allow us to provide braille tooling and components that we know meet industry standards. We ‘proof’ all our braille prior to shipping to ensure it is fit-for-use, to allow our customers to use it with confidence and to minimise any downtime that might arise through discrepancies. Through a similar process to Braille, packaging can be embossed during the flatbed cutting process. 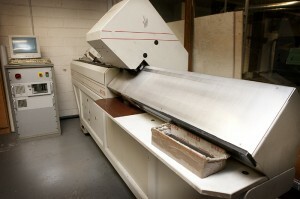 Custom made embossing forms can be fabricated and fitted to the flatbed die before the cutting takes place. Some embossing required accurate “fit” to printed areas while other embossing is ‘blind’. Tooling to create these effects on cartons, greeting cards and other substrates is manufactured and supplied by Truform. Embossing allows companies to give an added dimension to their packaging, for example by highlighting their company logos etc.. Embossing dies can be kept and reused for repeat runs and new jobs.